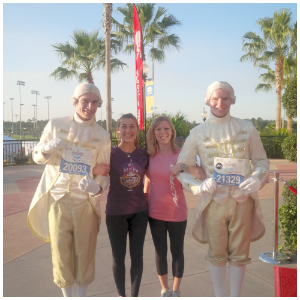 Fairytales and Fitness: The Item you Don't have to have ( even if you ARE a runner). 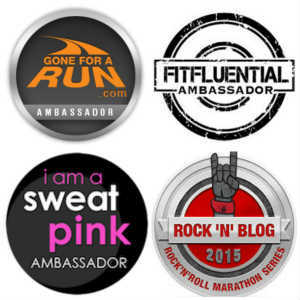 The Item you Don't have to have ( even if you ARE a runner). If you are a reader of our blog than chances are you travel to races, you travel to Disney, or you just like to travel in general. That's why when I saw this product I thought it would be a good thing to feature on our blog. As you know, we travel a lot ( For instance, I'm on my way to Disney right NOW). I for one am always trying to conserve space in my luggage ( yea, I don't like to pay more luggage fees than I have to). 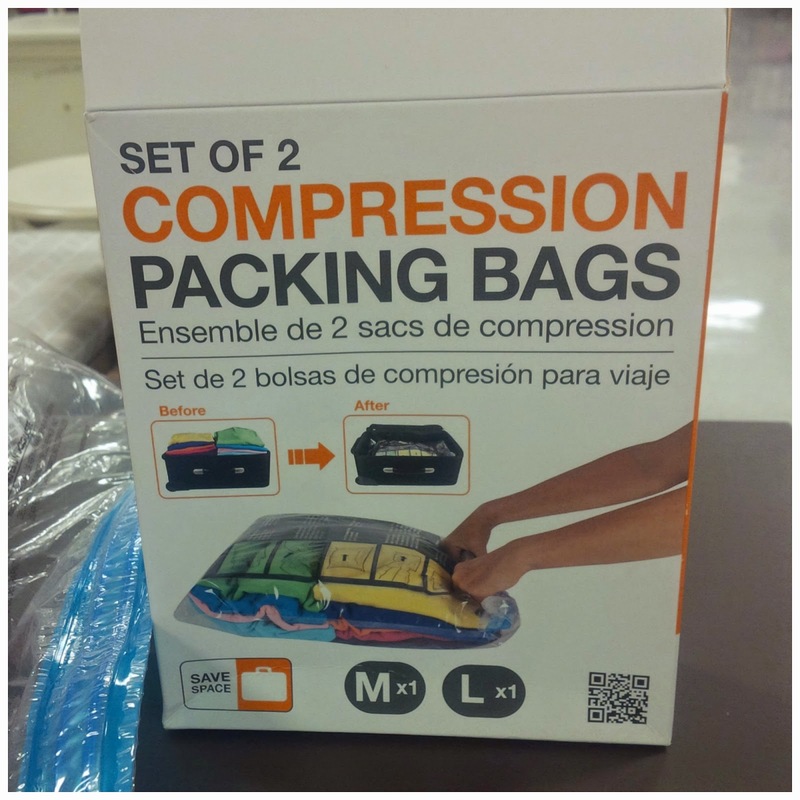 While shopping for some other products we came across these Compression Packing Bags. Runners like compression right? So I figures these bags wouldn't be all that bad...hehe. 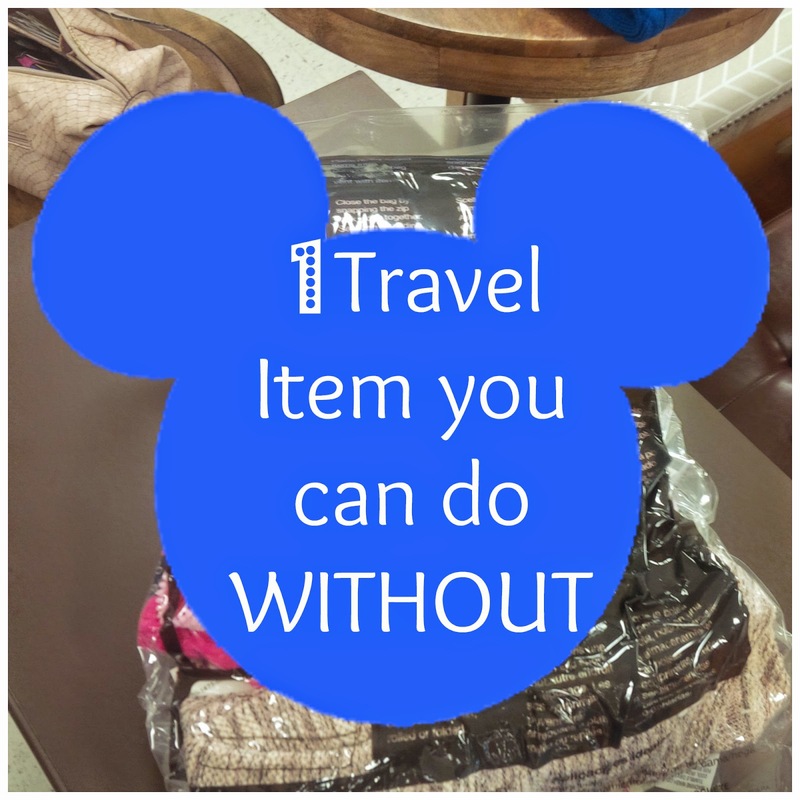 The object is to put your clothes in the bag, zip it up and then start rolling it from one end to the other. There is a small vent on the other side of the bag that releases the air as you roll it. This seemed like a good idea but I was a little skeptical. I wanted to try it first, so what did I do? I took a few items of clothing off the rack and put them in the bag. Yup, I did that. I put four tops in this bag ( they were all long sleeved, no tank tops) and this is all the further I was able to roll this bag up. Quite frankly I think I would have had better luck rolling these shirts up in a plastic grocery bag. 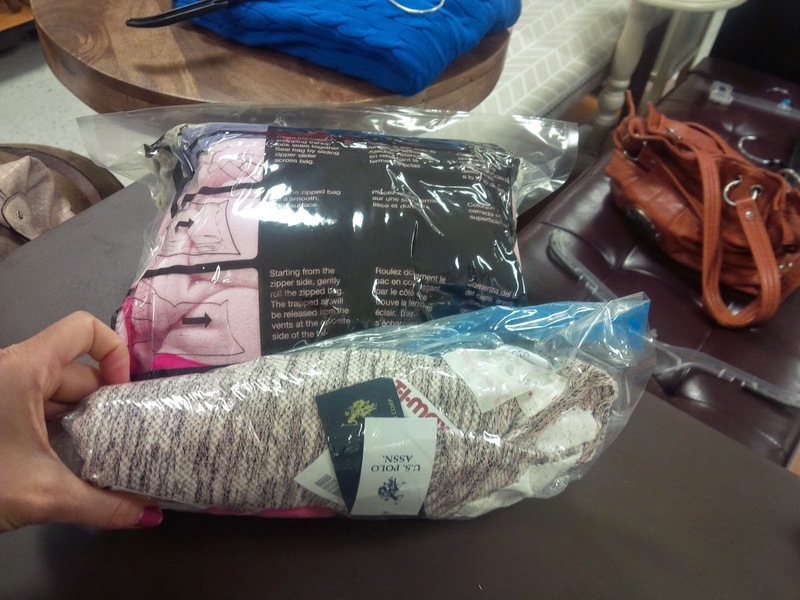 Needless to say I did not buy the Compression bags and I saved my $7.99 ( MSRP was actually $15.99 for the two bags, but they were on sale the day I was there). Do you have any secrets when it comes to packing? What works for you and what annoys you? Something I like to do is to fill my shoes with socks when I store them in my suitcase. Have a great trip! Oh that's a good tip! Thanks Tina. Simply rolling your clothes saves space and keeps wrinkles away. No fancy bag necessary. My nana told me that trick of rolling clothes but I don't seem to be able to do it in a way that saves me any space! This post made me laugh because I have owned compression bags for years and love them. I do not ever roll clothing when I put them in the bags. When my luggage is inspected by the lovely TSA agents, their hands are not touching my clothes and that makes me happy. The bags also save space and since I normally just carry on luggage (even for 2 week trip to Europe last year) it keeps my stuff the way I want it! These must have been the cheapy bags because I didn't seem to think they were very efficient. I don't have any secrets to packing, but I do have a few vacuum bags that work well for blankets...I never thought of using them for luggage! What a great idea! :) Hope you have a great time in Disney!! Can't wait to hear about it when you return! I roll my clothes to save space and put my socks inside my shoes. I also keep a travel sized set of toiletries in a ziplock bag in the bathroom so it's ready for me to grab whenever I take a trip. Wow, these didn't seem to work at all! I've heard other people swear by similar products so maybe some work better than others. I haven't tried any yet but we're pretty good at packing light. That looks so handy! I used ziplock bags for packing and sit on them to push all the air out - it's my non-technical version of the vacuum bag :) Have a great trip! No secrets here to packing. I'll admit, I'm an overpacker, and despite people's best efforts to change that I don't know that I'll ever change! I try to keep everything to carry on so I try not to overpack. I can throw in two pairs of jeans and then enough shirts to mix and match. I keep with the whole 80/20 rule so I don't really throw in anything that I don't really wear. I always pack stuff inside my shoes and I have a tendency to roll things- they seem to be less wrinkled. Have a safe trip! Or, Southwest. Definitely flying SWA for #Dopey15 - that's a lot of shoes!!! When my kids were the age to attend camp I packed each days clothing in a gallon zip bag. Each bag had a tshirt, shorts, socks, underwear. I need some of those bags... that's genius! Packing has always been a challenge for me. I agree with rolling clothes, putting socks inside shoes. We keep extra ziplocks to make sure we conform to the "one quart" rule for tubes and liquids. Very smart to test it out before buying! I like to think I understand the "art" of packing. But sometimes I still bring too much, or not enough. I finally decided as long as I get everything in the bag that I need for the race, anything else forgotten or otherwise won't matter:) Have a fun trip and a great race!!!! That is a shame they didn't work well. The vacuum bags work wonders! But those would be difficult to use unless you pack a vacuum in your suitcase for vacation lol! That is awesome and the next I fly I am using these. Packing is so tricky for me because I only ever do carry ons and I want to bring my road shoes, my trail shoes, and then just some fashionable walking sneakers. Well, that alone takes up like half my suitcase! I did have a bag just for my shoes, but then I decided just to take a bigger piece of luggage! I've used the bags when we have moved, but never thought to use them for traveling! Great idea!